1. Forever  Television Show -- I just started watching this show on Tuesday evening and I caught up within 24 hours. To say the least, I'm addicted to this show and I can't wait for more episodes to air. The show is a mix of Doctor Who, Sherlock, and something else [can't decided what] -- plus it stars Ioan Gruffudd. 2. 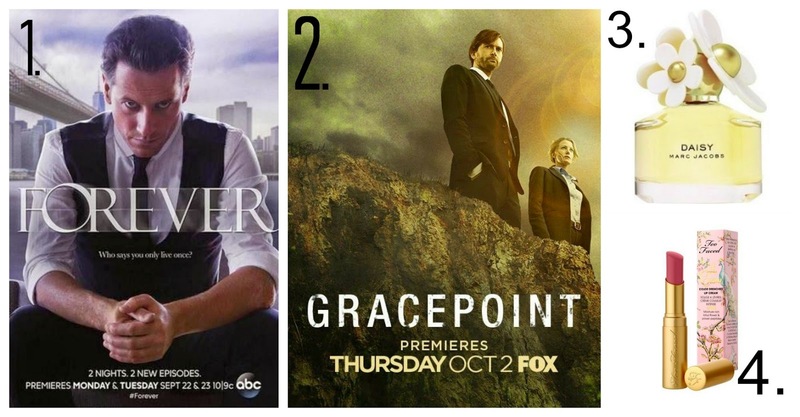 Gracepoint  Television Show -- The American remake of Broadchurch [another show which I enjoy watching], has been good so far. At times I get confused why they mention so many American things, than it hits me that it takes place in America, not UK. Duh. Also this show stars, David Tennant [who also appeared in Broadchurch]. 3. Marc Jacobs Daisy Perfume -- I recently picked up the roller-ball of this perfume at Ulta, and I've been wearing it non-stop since then. It is very lady-like and not too heavy of a scent. Give it a sniff the next time you are by a perfume counter that sells Marc Jacobs. 4. Too Faced Bumbleberry Lipstick -- Ah! I've been wearing this lipstick non-stop since picking it up after we hosted a Too Faced event at our Ulta store. It feels like a lip-balm, yet goes on like a lipstick with a bit of stain after-effect once it starts to wear off. The wonderful thing about Ulta is that they have products for every price-point. They carry both drugstore products and high-end stuff. You can see everything they carry, as well as find your closest local store on their website www.ulta.com. I've watched the pilot of Forever, and want to see more. I love Ioan Gruffud as an actor, and the show has a really interesting concept! Definintely going to check those tv series out- we seem to have similar tastes in shows. I am also hooked on Forever! I love the whole thing- especially this "Adam" person. Can't wait to see more!